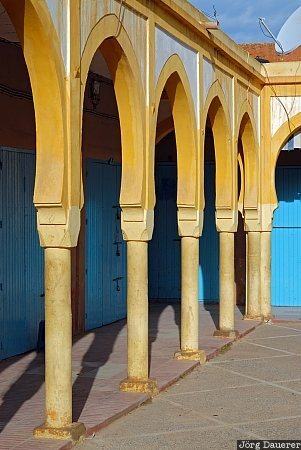 Yellow columns and blue doors in the background at a small market square in Tiznit. Tiznit is in Souss-Massa-Drâa in the southern part of Morocco. This photo was taken in the morning of a rainy day in February of 2010. This photo is part of the exhibition The color Yellow (June 2013). This photo was taken with a digital camera.